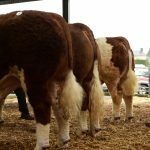 The Simmental Society Premier Show & Sale took place at Roscommon on Saturday last and trade for the quality animals was very brisk with average prices for both bulls & heifers up on the corresponding sale last year. 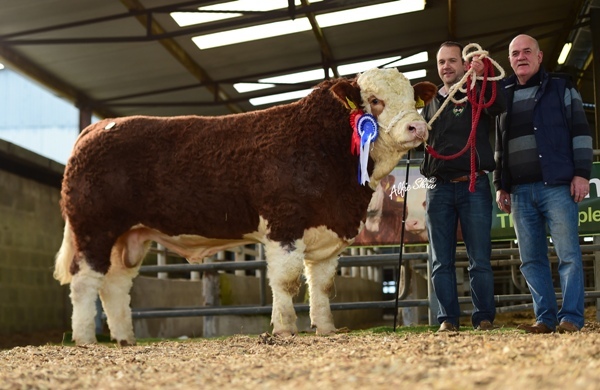 The increase in demand for the breed was again evident with two bulls purchased by A.I. Organisations. Judging on Saturday was Ian Green from the Corskie Pedigree Herd in Morayshire, Scotland. 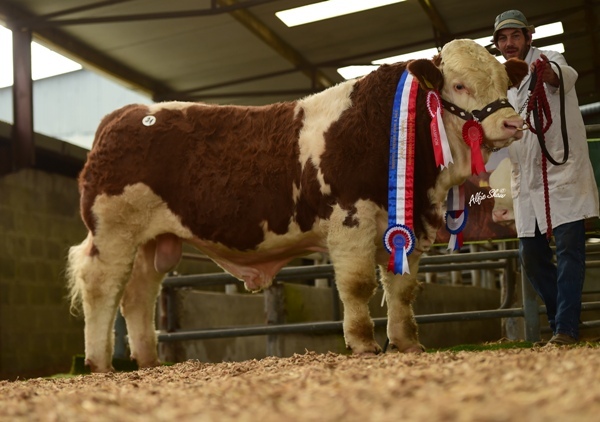 His Senior Champion Bull went on to achieve the highest priced bull at €9400 while his Junior Champion Bull recorded the second highest bull at €7600. 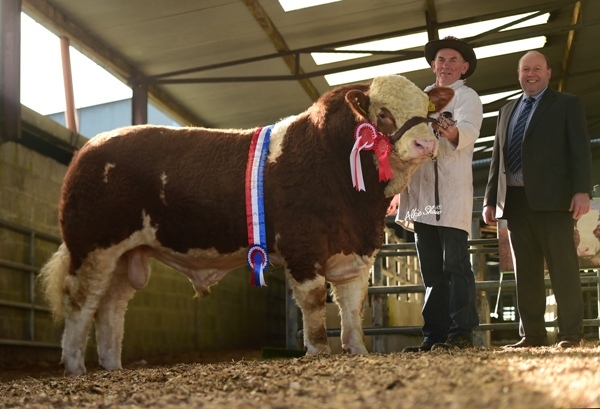 Claiming the Senior Bull Champion was Peter & Marion O`Connell, Mallow with Raceview Herman. This September `16 born bull is sired by Kilbride Farm Delboy and out of a Kilbride Farm Newry dam Raceview Bounty Matilda. 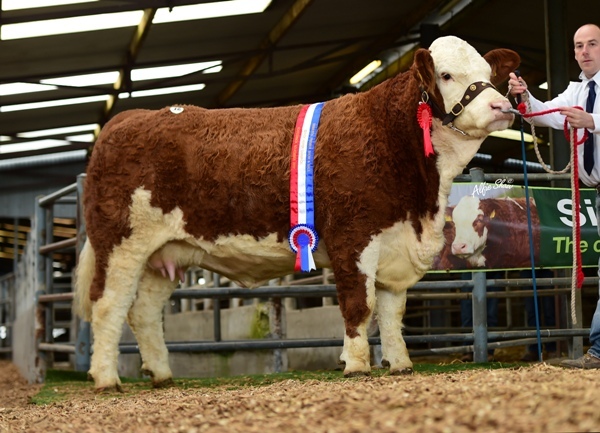 James Fox from Bray, Co. Wicklow was the successful purchaser of this bull at €9400 who earlier in the year was the Male Champion at the National Simmental Show in Tullamore. Reserve Senior Champion went to William O`Halloran, Chamberlainstown, Cahir with Bearna Dhearg Hugo. Sired by Dermody Butcher this August `16 bull was out of a Curaheen Wakeman dam Cruithill Blessington. 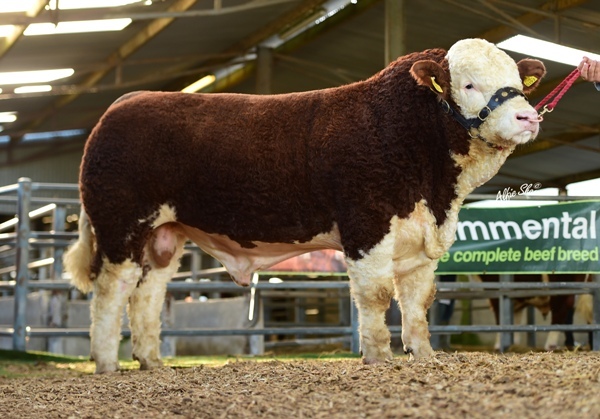 This bull was purchased by Vincent O`Halloran, Ruan, Co. Clare at €3600. 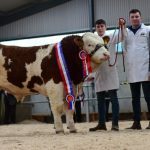 The Junior Bull Champion, Clonagh Hawk Eye ET, was exhibited by Garrett Behan, Ballyfin, Portlaoise and sold for €7600 to Gordon McFarland, Newtownstewart, Co. Tyrone. Sired by Kilbride Farm Dragoon this 13 month old bull was out of a Banwy T-Rex dam Clonagh Darling Eyes ET. 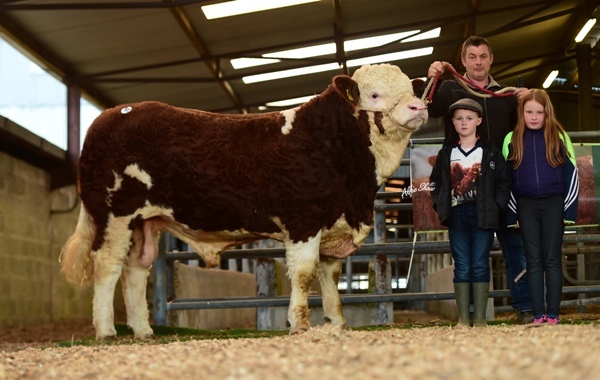 The Reserve Junior bull also went to William O`Halloran with Bearna Dhearg Haka. This October `16 bull is sired by Kilbride Farm Delboy and is out of a Curaheen Texas dam Ballyduff Brenda. Donal Callery, Cookstown, Co. Meath was the purchaser at €3700. €6800 for Mount Hawkeye a Curaheen Dickens son sold by Joe Kelly, Ennis, Co. Clare and purchased by Brian Botle, Dundalk. 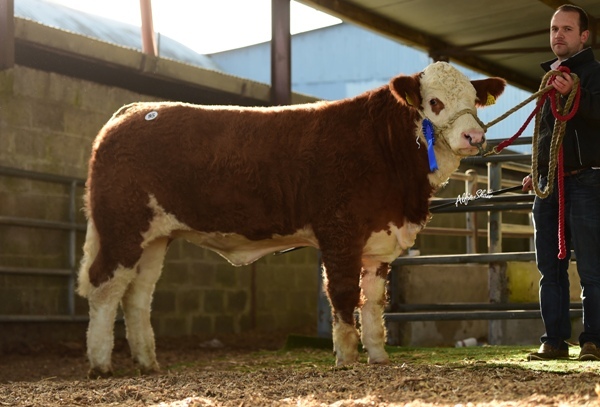 Multyfarnham, Co. Westmeath purchased this Kilbride Farm Delboy sired bull. was purchased by Dovea Genetics. 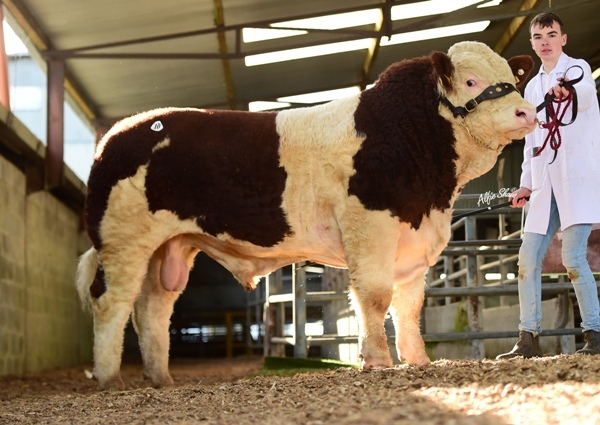 Tuam, Co. Galway purchased this Kilbride Farm Delboy son. 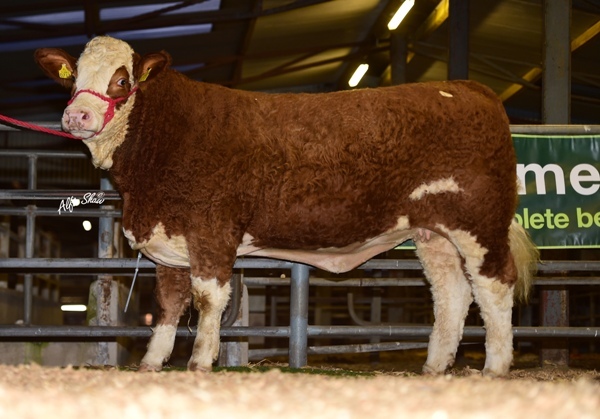 Newbiemains, Scotland purchased this Anatrim Bodybuilder bull. Overall Bulls recorded a clearance of 57% with an average price of €3900 with prices ranging from €9400 to €2300. 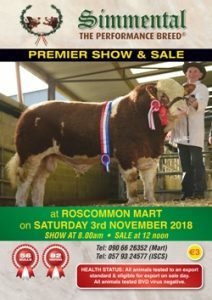 This November Sale always attracts the top heifers and this sale was no different with a top quality selection of females including a draft from the Raceview Herd on offer and the prices matched the quality topping at €12100. 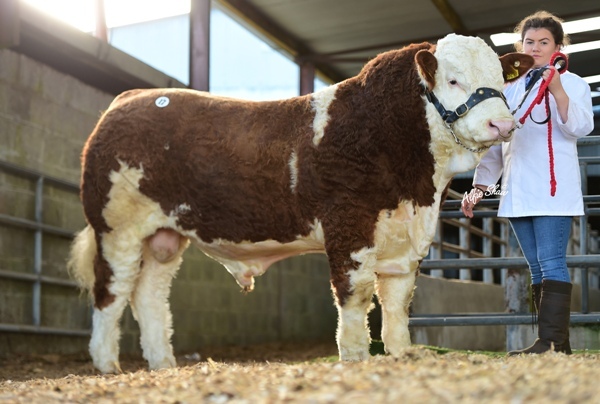 Hitting this €12100 mark was the Yearling Heifer Champion, Clonagh Honey Eyes, exhibited by Garrett Behan, Ballyfin. This August `16 born heifer is sired by Kilbride Farm Dragoon and is out of a Banwy T-Rex dam Clonagh Electric Eyes ET. Ian Green was the successful purchaser to join his Corskie Herd in Scotland. 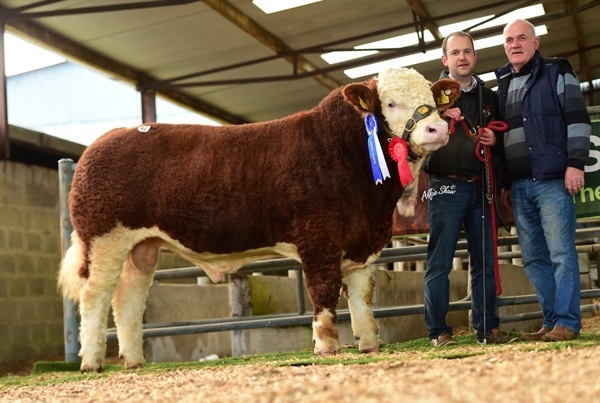 Ian Green also purchased the Weanling Heifer Champion, Tawley Hanna, at €10700. This December `16 born heifer was exhibited by Declan Oates, Castlegal, Co. Leitrim and was sired by Hillcrest Butcher and out of an Auchorachan Wizard dam Annadale Dainty. 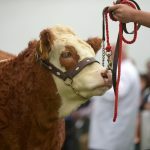 The Senior Champion Heifer, Tisaran Gemma May, was exhibited by Martin Mooney, Shannon Harbour, Co. Offaly. Paul Sammon, Nenagh was the purchaser of this Islavale Cracker sired heifer who is out of a Curaheen Vio dam Mohona Diana at €4800. 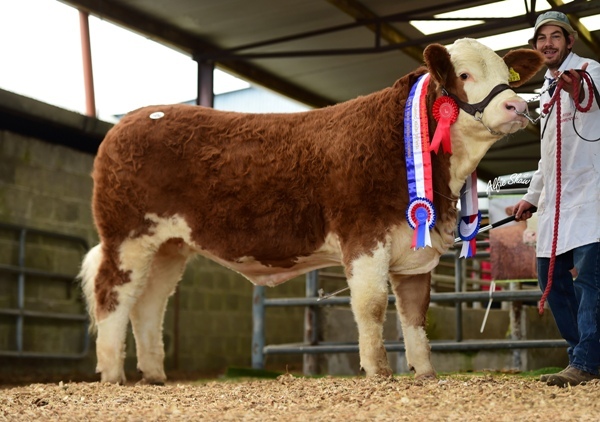 The Junior Heifer Champion, Coose Holly, was exhibited by John Tuohy, Whitegate, Co. Clare and this May`16 born heifer was sired by Hillcrest Butcher and was out of a Curaheen Vosco dam Knockane Betty. Padge Mulhare, Cloghan, Co. Offaly was the purchaser at €5700. The Senior Reserve, Derrough Grace, was exhibited by Paddy Bones, Kilkelly, Co. Mayo. This Delfur Decider sired heifer was purchased by Patrick McGovern, Glenfarne, Co. Leitrim at €3000. 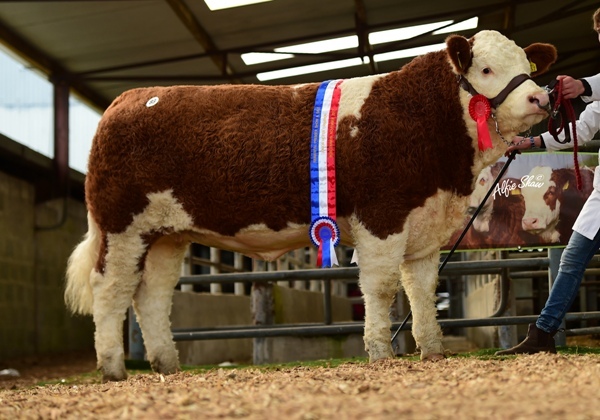 The Reserve Junior Heifer, Rathlee Hot-Stuff, was exhibited by Gerry Lenehan, Easkey, Co. Sligo. 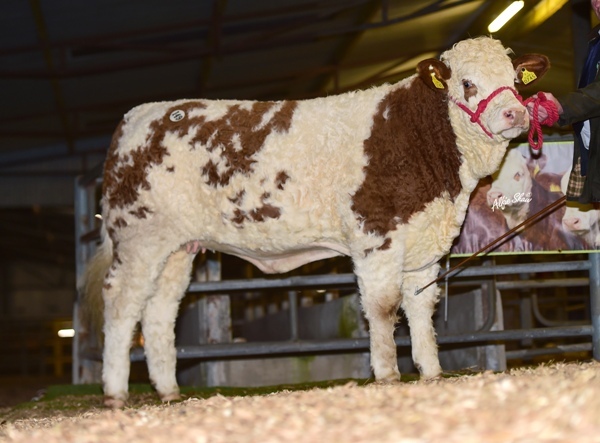 John Duffy, Ballybay, Co. Monaghan was the buyer of this Celtic Diceman sired heifer at €4100. 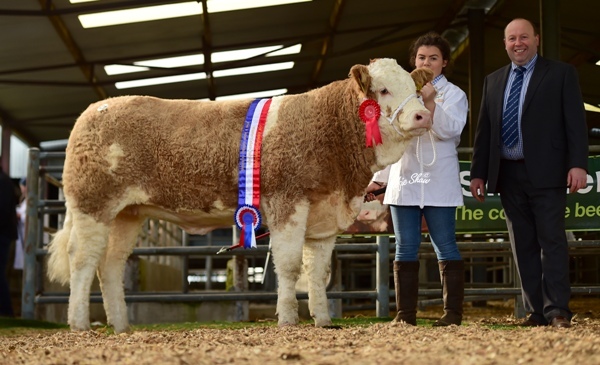 The Reserve Yearling Heifer, Bearna Dhearg Honeycomb, was exhibited by William O`Halloran. 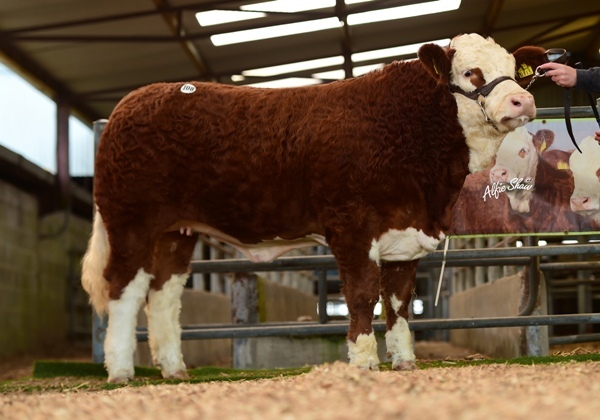 This Bearna Dhearg Frontier sired heifer was purchased by Leslie Weatherup, Lisglass, Co. Antrim at €4000. 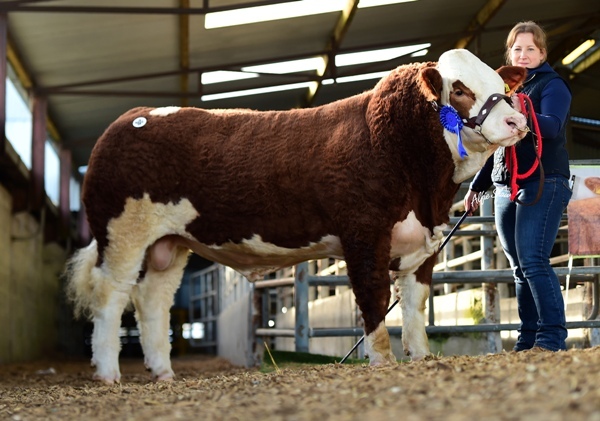 The Reserve Weanling Heifer, Jennalyn Jubilee Rose, was exhibited by Lyndsey Behan, Ballyfin, Portlaoise. This January `17 born heifer was sired by Kilbride Farm Dragoon and was purchased by Sean McKiernan,Corlesmore, Co. Cavan at €3900. €7200 for Fearna Hope ET sold by Gerry Neenan, Ballyhaunis, Co. Mayo. 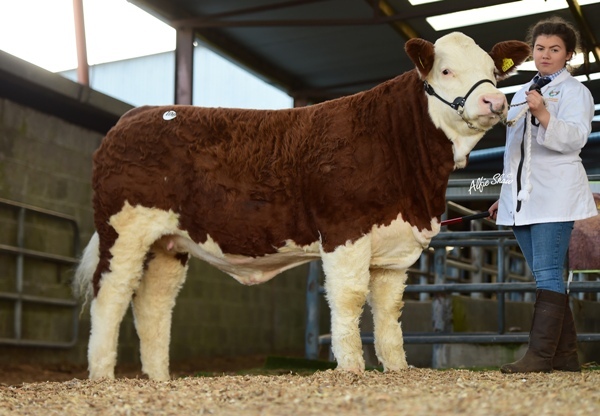 This Anatrim Bodybuilder sired heifer was purchased by Sean Larkin, Loughrea, Co. Galway. 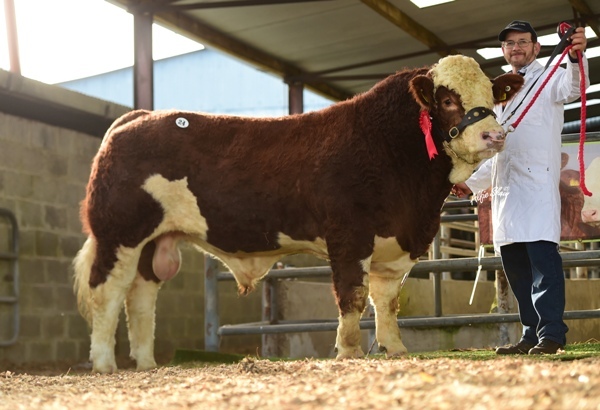 €6500 for Shiloh Hottie Royal exhibited by Hugh Murray, Moate, Co. Westmeath. This Kilbride Farm Bantry sired heifer was purchased by Ian Clarke, Rosses Point, Sligo. was purchased by Patrick Meaney, Old Leighlin, Co. Carlow. The Raceview Draft exhibited by Peter & Marion O`Connell, Mallow, Co. Cork had received a lot of attention during the day and it was very evident with the amount of customers who stayed late that trade would be strong. 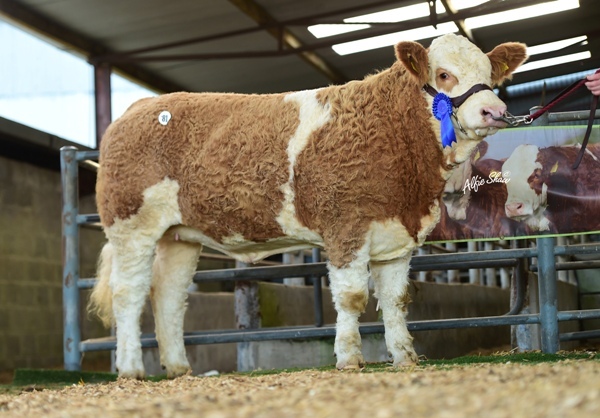 Topping this section at €10300 was Raceview Helena Charming a February `16 born Kilbride Farm Delboy heifer that was out of a Carnkern Titan dam Raceview Charming ET. Chris White, Dermotstown, Co. Dublin was the purchaser of this maiden heifer. 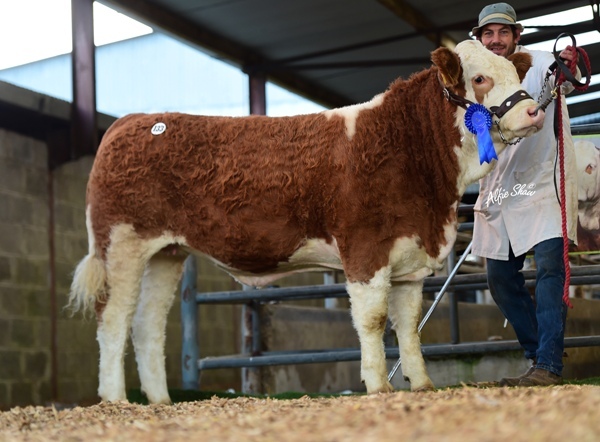 Selling at €8300 was Raceview Her Royal Di ET to Gavin Hayes, Lisburn, Co. Down. This 12 month old heifer was sired by Dermotstown Delboy and is out of a Glen Kristy dam Raceview Royal Diamond. Joe Wilson, Newry, Co. Down purchased Lot 143, Raceview Honey Chantelle, at €7000. This August `16 born heifer was sired by Dermotstown Delboy and out of a Raceview Vince Rayanne dam Raceview Chantelle. Overall in the Female Section there was a clearance rate of 79% with an average price of €3570 ranging from €12100 to €1700.